The lifelong "environmentalist" and environmental consultant thinks this is going to replace petroleum? This is the nonsense that gives environmentalists﻿ a bad name. Do your homework and you will realize that electricity comes from nuclear, coal and natural gas, almost entirely. Also, the millions of square acres of Northern Quebec already flooded and that will be flooded if we build this pipeline through NH to southern New England are something to consider. It is not just a transmission line. The definition of insanity is doing the same thing over and over again while expecting a different result. The United States Senate is at least half full of nutty people who have refused for the last seventeen years to ratify the Kyoto Protocol. That is why Voice of America (VOA)--the closest thing that my country has to China Daily, or state-run media--ran a story entitled: China: Canada's Kyoto Protocol Withdrawal 'Regrettable.' I read that story ashamed that it was not my government which was disappointed with Canadian PM Harper's decision, but, alas, the United States is not in a position to regret Canada's retreat from responsibility since it is not a party or signatory to the agreement. Today, I wake to the news that the POTUS has been backed into a corner and must now face the wrath of the electorate if he vetoes the payroll tax extension. Nevertheless, he should do it. Canada is an avaricious neighbor at this point. They are hoping to make lots of money and create temporary employment by the construction of the Keystone Pipeline and building thousands of miles of transmission lines to accompany mega-hydroelectric dam projects. This must be stopped. It is time for Obama to lead, not follow the polls. Chinese negotiators are just as insane to return year-after-year to the Conference of the Parties (COP) meetings, like Copenhagen, Cancun and Durban, in the hopes that the West, and particularly the United States, will pay reparations for decades, nay, centuries of oppressive policies. Even crazier than that, though, is their hope that the United States will change its way of life or that our broken democracy will soon stop sending men like Inhoffe back to the Senate. Men/ideologues who get elected on their stance on abortion, evolutionary teachings, and gays in the military (Romney, are you listening?) get to fool around with the important issues that governments should be dealing with, like economic development and climate policy. We all lose. China should stop hoping that crazy will go away, though, because that in itself is very crazy. Crazy is here to stay. Whimper or Bang: Who cares, man? The blame for the failure to produce any real progress at the climate talks lies with the US. For one, US President Barack Obama has not helped revive the talks that have stalled for years, because the world's largest historical source of GHGs has refused to accept any mandatory cuts. And the US refuses to change, or even modify, the American way of life, even though it never shies away from forcing developing countries, which historically have contributed a fraction of the emissions, to do so. It was written by OP Rana, a senior editor with China Daily. While I am sympathetic with the writer's anger at a process that I have come to refer to as the Hot Air Conference, this piece is an irresponsible rant. Obama could certainly lead more, nay, even a little would be nice. On the other hand, he is not responsible for men like Speaker John Boehner and Senator Inhoffe. The collective insanity of the American electorate (a small fraction of the American citizenry, by the way) returns these people to Congress year after year so that they can make mischief like the news we awoke to this morning. That Obama cannot fully and properly support his own appointee, EPA Administrator Lisa Jackson, is only partly a function of his spine. It is primarily a function of the realpolitik that he chooses to practice in a breaking or broken system that calls for such Machiavellian machinations. I dedicated years of my life to imploring the American public to change its way of life. But is this writer being ironic or experiencing cognitive dissonance? I condone the editorialist's frustration at the profligacies of the North American lifestyle. On the other hand, it is quickly being adapted by China which reports how its noveau riche are now the world's second leading consumers of luxury goods. They passed the US in this respect in 2009 and will pass Japan this year, according to Xinhua News Agency. See China to be largest luxury goods consumer in 2011. 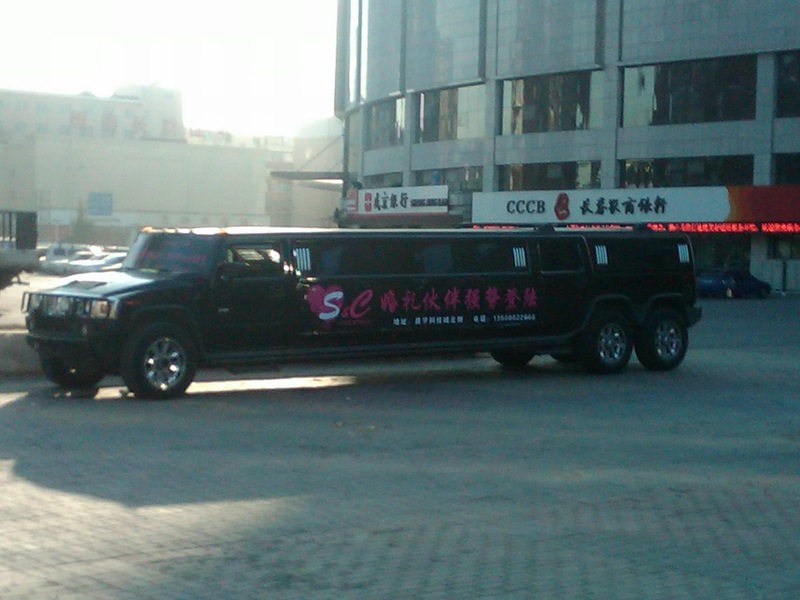 Here is a picture that I took today enroute to the tea market in Changchun, as a case in point. As somebody whose blood pressure surges when he spots such a vehicle, I can promise you that I have seen more of these opulent displays here than I ever did in America. You could "re-hair" most of the fauna in New England with the real and faux furs paraded around the streets here. National PM 2.5 Standards by 2016, But No Binding Climate Agreements Until 2020? Particulate matter in the air that is 2.5 micrometers or less in size is a serious health concern for many or, as China Daily says, "believed to pose health risks." The sources of such pollution are primarily large power plants and vehicles (i.e., burning fossil fuels). Incidentally, these are also the most focused-upon sources of climate gases. In Beijing, 105 people a day are diagnosed with cancer and one in four deaths there last year was attributable to this disease. But a couple weeks ago, China was not considering adding a PM 2.5 standard to air-quality regulations that it sought to update for the first time in ten years. There was, in part because of re-postings of the US Embassy in Beijing's Twitter feed with its daily PM 2.5 reports, a public uproar. In a show of responsiveness that is unthinkable in the United States, the Chinese government listened to its people and a PM 2.5 standard will be included now. China Daily bragged, "In making the announcement, the ministry showed once again that China is responsive to public health concerns." If one reads the entire article, though, you can see that 2016 is the expected implementation date for the new regs with pilot programs in a few fortunate metropolises a possibility. The year 2016 is after the Grade 2 students (equivalent to juniors in high school in America) whom I teach will have graduated from college. It is not particularly soon. On the other hand, it is four years earlier than China's negotiator in Durban signaled that his nation would be willing to consider binding carbon emission standards. One has to wonder how a nation that can respond in a couple weeks to a noisy citizenry and that is ready to regulate PM 2.5 by 2016 can justify waiting until 2020 to even start talking about binding emissions cuts. If the Chinese leaders really believe the science on climate change and think that climate change is an ensuing catastrophe in the making (which they do and it distinguishes them from the crazies running my own democracy), if they really care about the health of the workers of the world, they should stop the posturing at the COPs and push for binding standards by 2016. The term "common but differentiated responsibilities" is a legal fiction that is shaped by a history of grave and unacceptable injustices, but which is not shaped by reality or science. That London was belching smog at higher rates than China for most of the last two centuries does not diminish the fact that London 1850 was a fraction of China's size today or that China is now the world's largest emitter of greenhouse gases. China has a chance to display some sanity in the face of crazy. I hope she chooses well. Two wrongs don't make a right or, as they don't say here, "Two Wongs don't make a white." You need only visit the Asia Society's website to get a sense of what I saw in Beijing a couple weeks ago. A thirty minute cab ride for close to 50RMB brought me and Shannon out past 798 Art District to Three Shadows Photography Art Center where "Coal + Ice" has been showing since September for FREE. Coal + Ice is a documentary photography exhibition featuring the work of 30 photographers from China, the United States, Canada, Malaysia, Russia, Hungary, Poland, Norway, Italy, Germany and the United Kingdom, whose work, brought together here, visually narrates the hidden chain of actions triggered by mankind’s use of coal. This photographic arc moves from deep within the coal mines to the glaciers of the greater Himalaya where greenhouse gasses are warming the high altitude climate. As these mighty glaciers melt at an accelerated pace, the great rivers of Asia that flow from the Tibetan Plateau into the oceans are disturbed, and the lives of billions of people downstream are disrupted. It was fittingly frigid in the converted warehouse. We moved too quickly through the photographs and suspended movie screens, not pausing long enough in front of the panoramas of the Tibetan Plateau. The exhibit closes on December 28th. It will travel after that. There have been good articles about this show in The New Yorker, The New York Times, and numerous other publications. Last Friday night, I went to see Beijing Opera in Beijing. I want to share some pictures with you. Pictures are always worth a thousand words, but this is certainly one of the more visually stimulating things to see in the world. Before the performance begins, there is a young woman who plays the gu zhong on stage while one of the performers "puts on his mask." When he is done painting on his mask, another man comes out to help him don his unwieldy costume. There are four important roles in Peking Opera: Sheng, Dan, Jing, Chou. These Chinese words mean main male role, any female role, painted face male role, and male clown role, respectively. There are also important ways to breathe when singing the parts and many other intricacies of this old art form. The music is orchestral with a jinghu leading the pack. This grainy photograph is the best I can offer. I took dozens of photographs of the actual performances. Among the short operas we saw was "Farewell My Concubine." Workers prepare to lift a giant blade to be used as part of wind turbines at the Vestas Wind Technology Co. Ltd. factory in Tianjin, China, on September 14, 2010. The Chinese central government committed to increase renewable energy consumption to 11.4 percent of the energy mix by 2015 and 15 percent by 2020. This week representatives from 194 parties are meeting in Durban, South Africa, for another two-week round of climate negotiations under the United Nations Framework Convention on Climate Change, or UNFCCC. As always, all eyes are on the United States and China—the world’s biggest carbon emitters and, according to some, the biggest hurdles to a global climate agreement. When I was younger I was ashamed to admit I came from a remote village, yet I lacked the courage to claim I was from a city, so I usually said simply that I came from an outlying township. Now I must tell the truth, that I was born in an isolated village. Over the last few weeks, I have doubled the number of hours that my Chinese teacher and I spend together. The laborious task of learning a language is still reserved to one hour lessons on Wednesday and Friday, but now, on Mondays, Shannon and I, together with Fan Xin--our lao shi, or teacher, take out our brushes and write for two hours. We don't use ink, but dip our fox hair in water and write on a special cloth from which our masterpieces mercifully evaporate quite quickly. The traditional tools are shown below. Like everything else in China, you can purchase really cheap or really high end tools. Shannon has a nice set of mao bi, or calligraphy brushes. I have two brushes and a stone for the black ink, as well as a stamp and some red ink. The stamp is inscribed with my Chinese name in Traditional Chinese characters. We don't have a brush stand and I don't yet know what the spoon is for, but I do know that the black ink is made from ground stone. 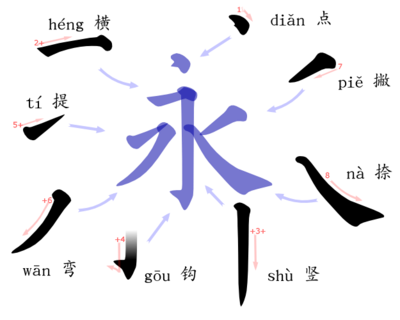 Here are the basic strokes which are, coincidentally, all contained in this Chinese character meaning "eternity." The gou can be affixed to any of the longer strokes so that the character below does not have a shu and a gou, but rather a shugou. Here is a picture of me hard at work. The inset shows a close-up of my attempt at writing my name, but there was too much water on the brush so that strokes appear bloated and puffy instead of elegant. That is a jar of honey by my left hand and the tea things that I mentioned in my last post. I am also learning to write using the nifty HSK preparation tool offered by nciku.com. HSK is short for Hanyu Shuiping Kaoshi (汉语水平考试) and is the pre-eminent Chinese test for international learners, administered by the Confucius Institute and widely used by Chinese companies and universities to assess foreign candidates’ Chinese skills.